After the leaves h^.e been spread on the garden—along with the plant residues, horse manure, rock powders, and other soil amendments—it's time to get out the rotary tiller. The tiller chops them into the top eight inches or so of the soil where plant roots do their foraging and the humus and nutrients do the most good. The tiller is thus the organic gardener's basic humus-building tool, but it is also a lot more. If you're approaching a weed- and shrub-infested or sodded piece of ground for the first time, intending to turn it into a garden, sample a small area with the tiller to make su»'c the machine has the muscle to do the job. Neither front-end tiller nor rear-moiinted mock-I will do a good job of primary tillage on heavy sod or dense weed growth in soil that has not been cultivated in recent years. Don't expect the impossible from any tiller, even the heavier rear-mounted ones which generally chop up plant residues better than lighter front-end types. A front-end tiiler will bounce off hard, sod-bound earth just about the way it will bounce off rocks. A rear-mounted tiller won't exactly bounce, but it will lunge forward, jerking you with it. If you have no other way to work such soil, the secret, with either kind of tiller, is to go lightly over the surface repeatedly, skimming off only an inch or less with each pass—slow, hard work. It's better to plow—or have someone plow—such soil in the fall, then work it in nicely the following spring with your tiller. Or, cover the area with deep mulch in the spring, and when that has rotted away together with the sod under it, then rotary till. '¡'he rotary tiller earns its keep on the ttcmestend by preparing garden beds in the spring, cultivating crops all summer long, and enriching the soil in fall with compost and cover crops. You may be able to chop up and incorporate heavy plant growth like corn with a pass or two of your tiller, but really heavy, dense growth should be mowed with a rotary mower first, That makes the job much easier, because inevitably that dense green stuff will tangle and entwine in the riller tines, and you'll have to get down and cut it out. A small amount of clogging can be cleared by reversing the direction of the tines while raising them just a wee bit above digging depth. 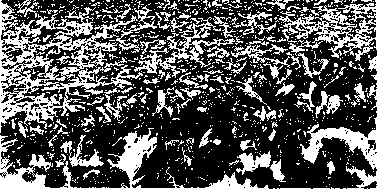 The kind of tines your tiller is equipped with—and how sharp they are—has more to do with clogging than whether the tiller is front- or rear-mounted. There are at least four kinds of tines: three-bladed chisel tines, four-bladed slicer tines, four-bladed slasher tines, and four-bladed bolo tines. Chisel tines are the cheapest, okay for cultivating, but they tangle the easiest if you try to incorporate plant residues with them. 1 wouldn't recommend chisel tines for organic gardeners. Slicer tines will dig from six to nine inches deep but will also tangle and clog where there is a tot o£ plant residue. Slasher tines are designed to cut and chop residue better with less clogging. They are longer than slicers (on horsepower models) and will dig up to 11 inches deep. Bolo tines can be used on the bigger, six to eight horsepower tillers; these tines are heavier and wider aad move more dirt per revolution, so you can move along at a faster speed. They are also less affected by clogging. As you shop for a tiller, another choice presented is between gear-driven and chain-driven models. Gear driven models are usually, if not always, combinations of belt and gear drives. A belt transfers the power front the motor shaft to the worm gear shaft, which then transfers power to the tine axle. 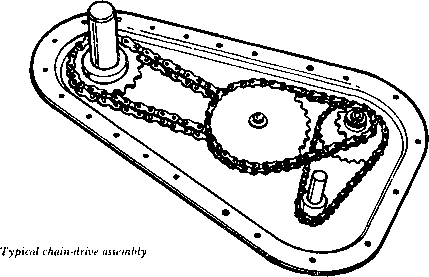 Mathematically, the chain drive is more efficient since the transfer of power is more direct. Which is better? It's a toss-up in my opinion, as long as you are comparing models in the same price range. Chain drive will probably wear out quicker but is easier and cheaper to repair. So let's pretend you have bought your tiller, and it's the first day of the gardening season. Preferably, your garden has been cultivated the previous year or was plowed the previous fall if virgin ground. You pick up a handful of dirt, squeeze it into a ball, press your thumb against it. If the ball crumbles apart easily, the earth is ready. Don't try to see how deep the tiller will dig on the first pass—especially if you have plowed under sod. You don't want to drag those sod chunks back to the surface. Let your tiller dig only a couple of inches on the first pass. If you have the time, let the ground dry a bit before making a second pass. The second time, the tines will bite into the ground more easily and work the ground into a fine, crumbly texture. Dig at least six inches deep, and try for eight to ten, if possible. Set the brake bar at the rear of front-end tillers at a depth that will allow you to push it in and pull it out of the ground with ease, according to the depth you want to dig, Don't fight your machine; let the brake bar and the tines do the work. You push down, the brake bar holds the tiller back for digging; you let up, the tines propel the tiller forward. With gentle pressure between up and down, you allow the machine to inch forward slowly while it digs. A rear-mounted tiller is even easier to handle. You set it for depth and speed; then all you have to do while the machine digs is guide it. Work the ground the second time at right angles to the first pass if possible. You may need to go over the ground a third time to get a fine seedbed, but usually twice is enough, if your soil is in good condition. After planting, your tiller becomes a weed cultivator. It can be used as a harrow for that first important cultivation of deep-sown seed (two to three inches) before the seed comes up, but when weeds are already germinating. This type of cultivation is tricky. You want to go over the ground very lightly, gently disturbing the soil surface without digging in to disturb the germinating seed. Skim very fast over the row, and von will kill many small weeds you can't even see yet. But don't try this technique oil shallow-sown seeds. As soon as your plants are above ground, ycu can start cultivating with the tiller between the rows. Unlike shovel cultivators, the tiller tines will not throw dirt onto the new plants and bury them, if you do not dig too deep. For cultivating, deep digging is not necessary anyway and can be harmful. If weeds are growing faster than your plants, however, and you must dig a little deeper to control them, you can buy special plant shields that fit on either end of the front-end tiller axle and prevent the dirt from falling on your plants (Sears has them). The hood on a rear-mounted tiller performs the same job. When your plants are taller, you want the tiller to roll some dirt into the plant row, if possible, to bury the tiny weeds emerging there. That can save you hand weeding. So, without shields, you let the tiller dig a little deeper than you might otherwise, though not so deep as to cut into your plants' roots. Front-end tillers can be modified quickly to cultivate between rows as narrow as six to eight inches or as wide as 26 to 30 inches. The narrowest width is achieved by taking the outer tines off completely and turning the inner ones around so the blades point inwards. Two intermediate widths can be attained by either leaving the two outside tines off completely with the two inside tines in regular position, or by replacing the outer tines with the blades pointed inwards and the two inner tines in regular position. Clip bolts, which hold the tines on the axle, are easy to remove, and the tines are easy to slip off the axle. Remember to allow a few inches more for row width than the width of your various tine positions. If, for example, you intend to cultivate a swatch 26 inches wide, make your rows at least 30 inches wide— if not 32—to accommodate that 26-inch width. Why? You don't want the tines cutting too close to your plant roots; and when the plants grow taller, the whirling tine blades have a way of reaching out and grabbing them if you get too close. If a tiller could talk, it would probably sigh, "A tiller's work is never done." Attachments turn it into a digger of garden irrigation ditches, or furrows, or rows for planting seeds. There's a hiller attachment for front-end tillers, too. I even know of someone who turned his tiller into a sidewalk edger by replacing one of the outside tines with an old plow coulter welded to a piece of pipe! Tillers are handy for renovating berry patches and ripping out runners that are getting out of control. The tool is handy for pruning raspberry suckers growing out beyond the sides of the row where they don't belong. 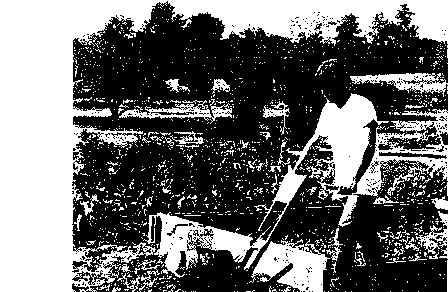 For cultivating or incorporating mulch under fruit trees in small orchards, the tiller is better than more cumbersome tractor machinery, and it is handier for cultivating under trellis wires between grapevines. The tiller is superb for running over asparagus beds in fall or spring to kill weeds and volunteer asparagus seedlings growing above the deep-set roots. Just don't dig more than three inches deep. Some chicken farmers, who raise their flocks on litter, utilize tillers to mix and stir the old litter in place on the coop floor to speed the composting process. Tillers are handy to mix compost in large worm beds, too, before seeding with worms. In any raised bed, or confined greenhouse bed, the tiller is about the only power tool that can be utilized. Lighter models that can be lifted in and out of the beds without back sprains are preferable for this kind of work. Care of the tilling parts is simple. Keep the oil bath around the worm gear at the specified level. On chain-driven models, the chain and bearings should be lubricated when and if it is necessary. The motor, the heart and soul of your tiller, requires much more attention. Most walking, self-propelled tillers, if not all, are powered by air-cooled, one-cylinder, four-stroke engines—which, to mechanical amateurs lik: myself, simply means that they take oil in the crankcase and gasoline in the engine, and you do not mix the two as you do with two-stroke engines. According to Allen Brown, agricultural engineer at Purdue, a properly maintained four-stroke engine ought to give good service for at least five to eight years and probably longer. If an engine fails sooner than that, it usually means improper care. "A main cause of early failure is not keeping enough oil in the crankcase," he says. "Another is failure to change oil as often as recommended, and a third is using the wrong kind of oil." Brown recommends changing oil every 25 operating hours—or sooner if very dirty conditions prevail. Use SAE 30 weight oil in summer and SAE 5w-20 or 5w-30 in winter (if you use your tiller in cold weather, which is not likely). If you can't get 30w, 10-30 will do. Do not use nondetergent oils with an API classification of MS, SC, SD, or SE. Clean the air cleaner whenever you change oil, or more frequently. Neglect allows dirt to get into the cylinder and cause bearing failure. There are oiled filters, dry filters, and oil bath filters: follow the manufacturer's directions for your particular model. Keep the whole motor clean. Don't let dirt and debris clog the cooling fin, as an overheated engine wears out faster. An old motor can often be given new life by cleaning out the carbon buildup in the exhaust ports. Take off the muffler and you'll find the holes (usually three). An important rule in keeping an engine running longer is never to run it at top speed for extended periods of time. There's rarely an occasion that justifies roaring around the garden at full throttle. You'll get finished at half-speed just a;» soon—and with better fuel efficiency. And your neighbors will love you, too. 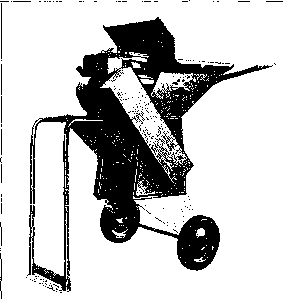 Perhaps it is surprising to find coverage of the familiar front-mounted Rototiller in a book specializing in the hard-to-find. But surprisingly enough, there is a hard-to-find aspect to tillers which makes them an appropriate consideration for the farm tool collection, and that is versatility. Of course, the simplest models are strictly for tilling; they have front-mounted tines to break and cultivate the soil. But realizing the multipurpose potential of the little tiller as a power source, some manufacturers have produced attachments for a variety of operations. In North America, attachments are designed mainly for cultivation, white European models have a number of working tools for jobs like pumping and spraying.